BIRCHWOOD, Wis. – Welcome back everyone! I’m super glad to have a bit of free time to write up a review of what I’ve been up to since the Grand Prix of St. Petersburg. I’m writing this during the first day off I’ve had in quite some time. While I’m not rocketing around a racetrack I work at the Minikahda Club in Minneapolis as an outside services attendant and a caddy. It’s an awesome way to meet new people and the bonus of being able to golf for free at an incredible course is a nice perk! 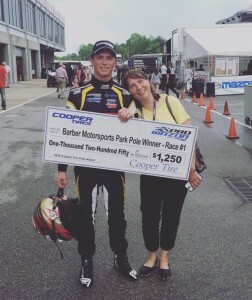 We’ll check back in on my day job later on, but first, let’s dive into how my rookie season in the Pro Mazda Championship Presented by Cooper Tires is shaping up so far! Four races, four podiums, two poles, one win and second in the championship standings. The stats don’t lie. My 2016 season is off to an incredible start! 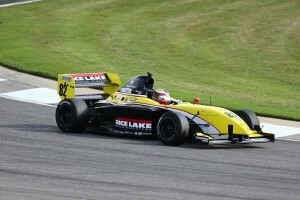 To even get a seat in Pro Mazda was a huge accomplishment for me. And now to have this much success right off the bat is unreal. I’m feeling super comfortable this year and am just driving free and relaxed! So that’s what I’m going to continue to do. Now, I’m going to try something a little different with this blog and take you into a day in my life leading up to a race weekend… Let’s go! Thanks to my cousin Mark, I live at his house in Mounds View, Minn. A suburb of Minneapolis. Mark’s “sponsorship” is free rent! Despite his requests you will never get to see a photo of Mark’s face plastered on the side of my car. I am the official lawn care expert of the house as I put down some of the best mow lines you’ve ever seen. But I digress about my awesome lawn fading skills. As I mentioned at the beginning I work at the Minikahda Club during the week. 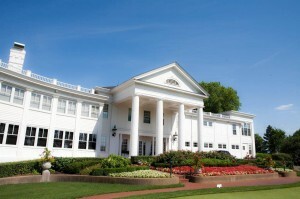 The Minikahda Club is the oldest country club west of the Mississippi! With history like that you can imagine that they attract some pretty powerful members. As I am constantly trying to expand my network of contacts you can see how a country club is a great place to work. It has given me the opportunity to meet people I would have never been able to get in contact with otherwise. I go to work every day channeling my inner Danny Noonan and looking like a frat boy from Texas. 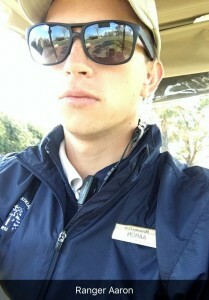 As an added bonus of being able to mingle with millionaires all day I also get to drive the cart that picks up all the balls at the driving range! As you can see from the photo it has a pretty aggressive front wing. After work at the club I usually hang around and hit some golf balls at the range or chipping green. I hereby challenge anyone in the racing business to a golf match. I hear IMS has a pretty nice course. Loser pays the green fees! 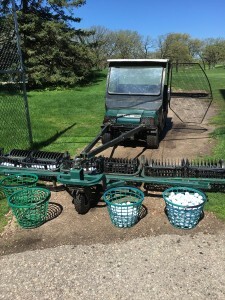 After a little golf practice I head home and try to figure out how I’m going to keep affording to race. The breakdown of this activity goes a little like this: Feeling completely hopeless; coming up with a brilliant idea; getting that idea shot down; start thinking Walter White had the right idea; having a small breakthrough; having most of that small breakthrough fall apart; actually making something happen. I am super stoked to be able to say that the newest part of “actually making something happen” is that I have partnered with Morrie’s Mazda for the month of May and the Grand Prix of Road America! If you’re in the Wisconsin/Minnesota area the week leading up to the Grand Prix of Road America look out for an exciting event happening with Morrie’s Mazda. Up next are three races in Indianapolis! Two at the IMS road course and one at Lucas Oil Raceway. I can’t wait to get going with the month of May all leading up to the 100th running of the Indianapolis 500! I’m so thankful to be able to continue to pursue my career in racing thanks to Rice Lake Weighing Systems, Rising Star Racing, Morrie’s Mazda, Fred Thomas Resort, Thomas Marine, Team USA Scholarship, Styled Aesthetic, my parents and all of you!